As the purchaser of Plain ’n Fancy Kitchens, Inc. (“Plain & Fancy”) cabinetry, you have invested in cabinetry built to the highest standards of workmanship. 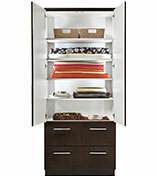 Your Plain & Fancy custom cabinetry is protected by our limited lifetime workmanship warranty (the “Warranty”). This Warranty is extended to the original purchaser only and is not transferable. Plain & Fancy does not extend this Warranty to subsequent owners of the cabinetry. In order to be covered under this Warranty, the original purchaser must register the cabinets with Plain & Fancy within thirty (30) days of installation. 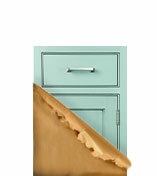 Please visit www.plainfancy.com/warranty to register your cabinets. Plain & Fancy warrants that the original purchaser’s registered Plain & Fancy cabinetry will be free from defects of workmanship under normal household use for as long as the original purchaser owns the home in which the cabinetry is installed. Specifically, this Warranty applies to the following: cabinet front frames, cabinet doors (for door warpage, see Special Notes below), cabinet back and side panels, shelves, tops and bottoms, drawer fronts and drawer bodies. The hinges and drawer guides used in Plain & Fancy cabinetry are covered by a lifetime warranty by the manufacturer of the hinges and drawer guides. Defects or damage arising from improper or negligent installation, misuse, accidents, alterations (regardless of whether the alteration caused or contributed to the defect), or improper care. Cabinetry that has been exposed to water, also extreme high or low humidity. Natural characteristics of wood (see below). Labor costs, including the costs of removing and reinstalling the cabinets. Transportation or shipping costs incurred in connection with this Warranty. Natural woods, even from trees of the same species, may differ in color, texture and graining. Wood may exhibit subtle changes over time as it ages. Natural and painted finishes on all furniture will at times vary in color tone and grain characteristics. Painted face frames, doors, and other painted parts of the product may eventually have visible cracking around the joint areas. These changes may be accelerated or intensified by sunlight, smoke, household cleaners and other environmental conditions, and such conditions may eventually cause the wood to warp, split or crack. These variations are considered the natural characteristics of the material in relation to their environment and normal wear and tear and are not covered under this Warranty. Door Warpage: All doors less than 24 .” wide and 45” high will be warranted if warpage is greater than 1/8”. All doors over 24 .” wide and 45” high will be warranted if warpage is greater than .”. Upon installation, a cabinet may be forced out of square. The door(s) of an out of square cabinet will appear to be warped, when in fact they are not. Please remove all doors and check them on a flat surface for the above stated warpage tolerances before requesting replacement. Note that mortise and tennon doors over 45” high and made as one panel at the customer’s request are excluded from this Warranty. Climate Controlled Environment. To minimize warpage and moisture expansion of wood products, Plain & Fancy products should be maintained in a climate controlled environment that avoids extreme temperatures and extremely high or low humidity conditions. Plain & Fancy will not warranty product stored or installed in any uncontrolled environment. If a covered defect occurs, Plain & Fancy will elect, in its sole discretion, to either repair or replace the defective material or component free to charge. Plain & Fancy reserves the right to change its product and finish catalogs from time to time without notice to its customers. If a warranty claim is filed on a product or finish no longer offered and Plain & Fancy elects to replace the material or component, Plain & Fancy will substitute a material or component that it deems to be comparable in look and style and of equal or greater value. Plain & Fancy does not guarantee that finishes on replacement materials or components will exactly match the finishes of Plain & Fancy cabinetry already installed in your home. You must make your warranty claim to the dealer from whom you purchased the cabinets, and your claim must describe the nature of all the alleged defects. If you are unable to contact the dealer, you may write to: Plain ’n Fancy Kitchens, Inc., 2550 Stiegel Pike, Schaefferstown, PA 17088. This Warranty is Plain & Fancy’s exclusive express warranty, and Plain & Fancy disclaims all other express warranties. In no event shall Plain & Fancy be liable for incidental or consequential damages to the original purchaser or any third party. No dealer or agent of Plain & Fancy has any authority to change or enlarge the warranty or enlarge the above warranty or our liability. Choice of forum; jurisdiction; choice of law. The original purchaser agrees that any disputes regarding this Warranty and warranty coverage hereunder will be submitted exclusively to the jurisdiction of the state courts for Lebanon County, Pennsylvania. The original purchaser agrees to personal jurisdiction of these courts. This Warranty is governed by, and shall be construed in accordance with, the laws of the Commonwealth of Pennsylvania, without giving effect to provisions regarding conflicts-of-law.